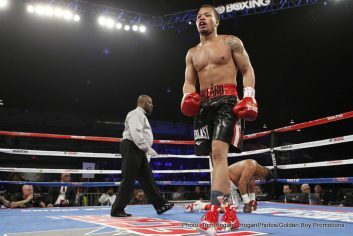 By Dan Ambrose: In an embarrassingly one-sided fight, interim WBA heavyweight champion Luis “The Real King Kong (25-0, 22 KOs) flattened the aging 44-year-old former two-time world title challenger Tony “The Tiger” Thompson (40-7, 27 KOs) in stopping him in the 6th round on Saturday night in a fight televised by HBO Boxing from the DC Armory, in Washington, District of Columbia, USA. Ortiz, 36, knocked Thompson down with a left hand to the head in the 6th. Thompson hurt his knee and couldn’t get back up. 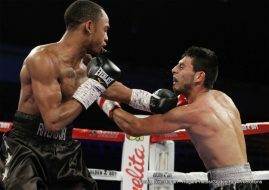 Referee Malik Waleed then halted the fight at 2:28 of the round. 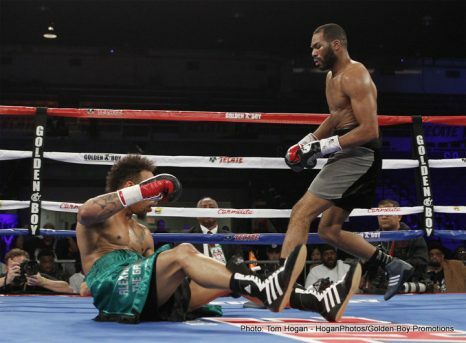 Ortiz also knocked Thompson down with left hands to the head in the 1st and 3rd round. 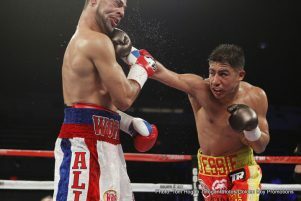 This fight looked more like a sparring partner matched against a champion rather than a contender. HBO needs to do a better job of filtering poor mismatches this because this was entertaining. It was pathetic. 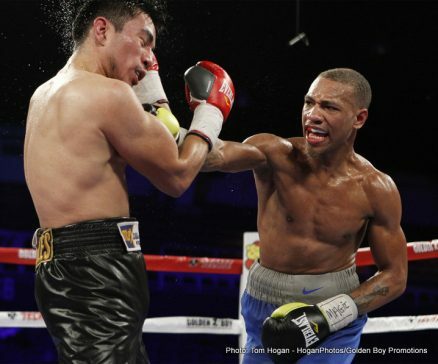 Thompson was able to land some short left hands and right hooks to the head of Ortiz on a fairly constant basis. 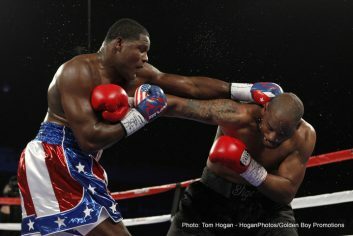 The problem was Thompson didn’t have enough punching power to do anything to Ortiz. 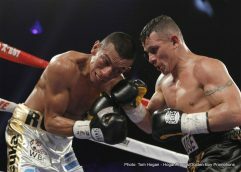 Further, Thompson was fighting at such a slow pace that it allowed Ortiz to fight slowly rather than in a rush. 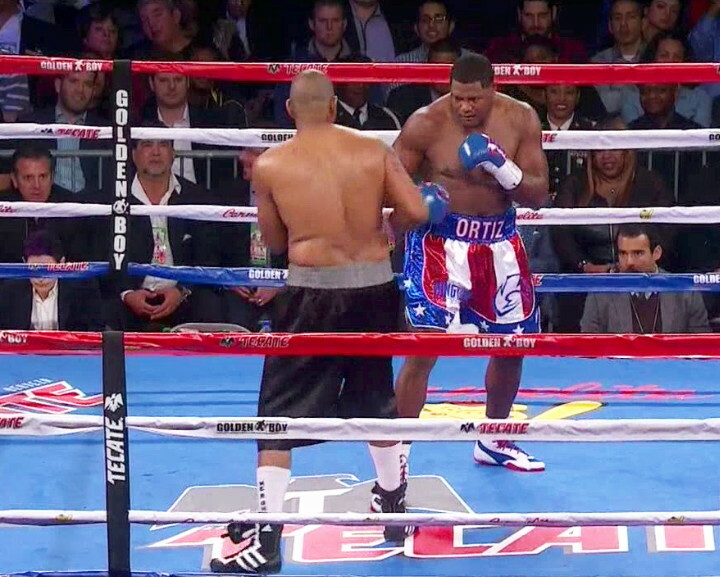 Ortiz’s stamina is still unknown at this point. 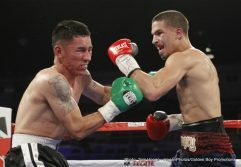 Thompson should have at least tried to push a fast pace because it was clear that he was going to lose the fight anyway in fighting so slowly and getting clocked as often as he was. 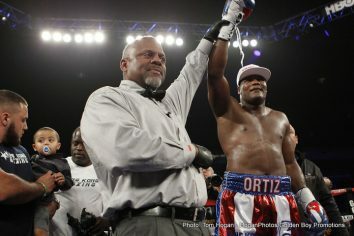 Despite getting the victory, Ortiz did not look that good. 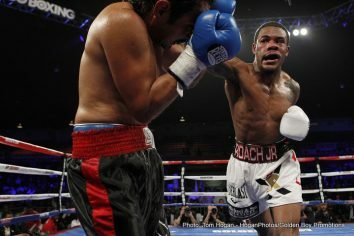 He looked a 40ish heavyweight that only seems capable of throwing left hands. The southpaw Ortiz looking to catch Thompson with that shot all night long, and Thompson made it easy by keeping his right hand low at all times. 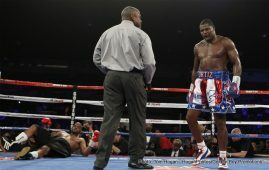 It looked like Thompson was concerned about getting hit in his flabby midsection, as he came into the fight weighing 263, which was quite a big heavier than the 247 he weighed for his first title fight against Wladimir Klitschko in 2008. 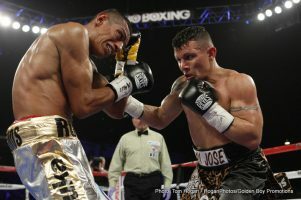 That fight was stopped in the 11th round after Thompson hurt his knee. It’s unclear how many years Thompson has had a knee problem. Ortiz will need to work on his defense before he takes on the likes of Tyson Fury, Deontay Wilder, Anthony Joshua and Wladimir Klitschko. Those heavyweights would have been a real problem for Ortiz if they were inside the ring with him tonight. They would have picked up on Ortiz’s tendency to throw left hands all the time, and they would have made adjustments to take away that weapon and counter him each time he threw it. 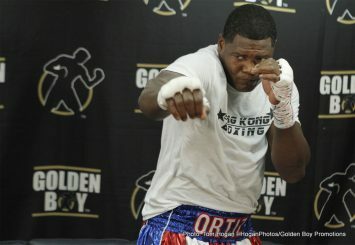 After the fight, Ortiz said he wants to fight all the top heavyweights in the division next. However, that doesn’t look like it’s going to happen. The World Boxing Association has a tournament going on, and they want Ortiz to fight #5 WBA Alexander Ustinov. Whether Ortiz will do that is unknown. The newly crowned WBA World heavyweight champion Lucas “Big Daddy” Browne is supposed to be fighting 43-year-old #6 WBA Fres Oquendo next in his first defense of his WBA title. If Ortiz wants to fight for the WBA heavyweight title in the future, then he’s probably going to need to follow the WBA’s wishes and face Ustinov. Ortiz isn’t going to get it done by calling out the top heavyweights in the division. The only way he can get the bigger fights is by making a name for himself by beating Ustinov, and then winning the WBA heavyweight title by taking part in the WBA’s tournament. 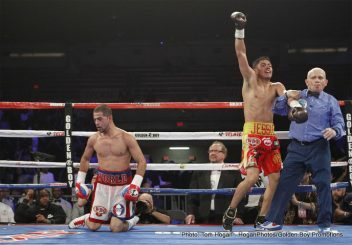 Once Ortiz has the WBA title in his possession, then he can start making a name for himself and eventually start getting some of the top heavyweights to fight him. But right now, he’s wasting his time trying to call out the other heavyweights. Ortiz needs to aim low right now and slowly pick up the name fighters one by one.